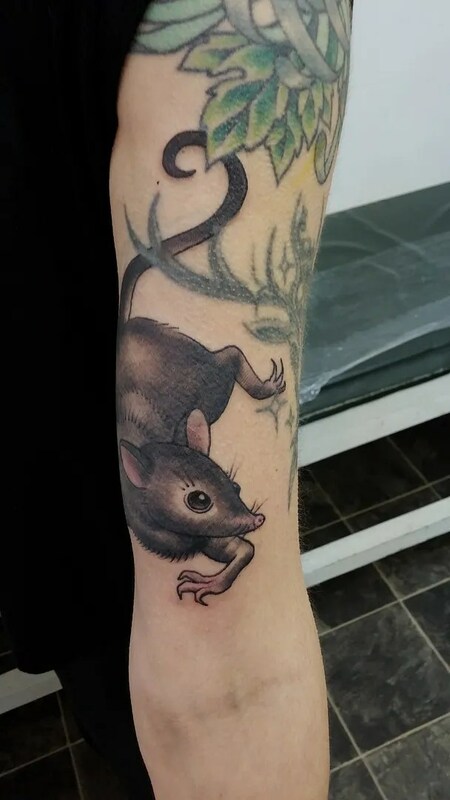 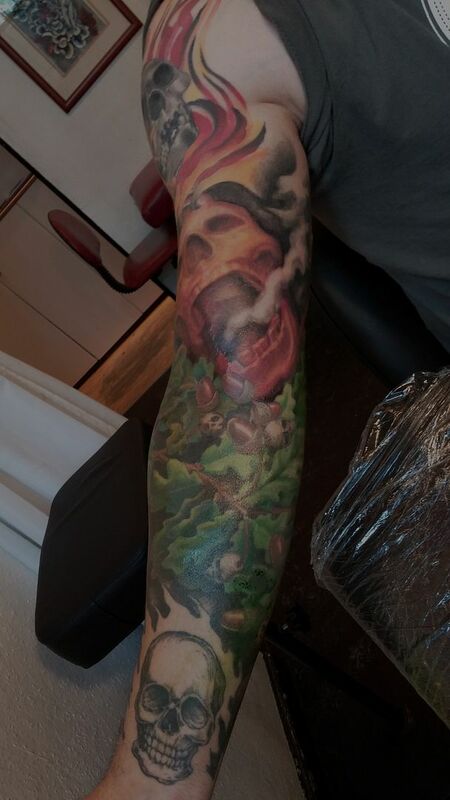 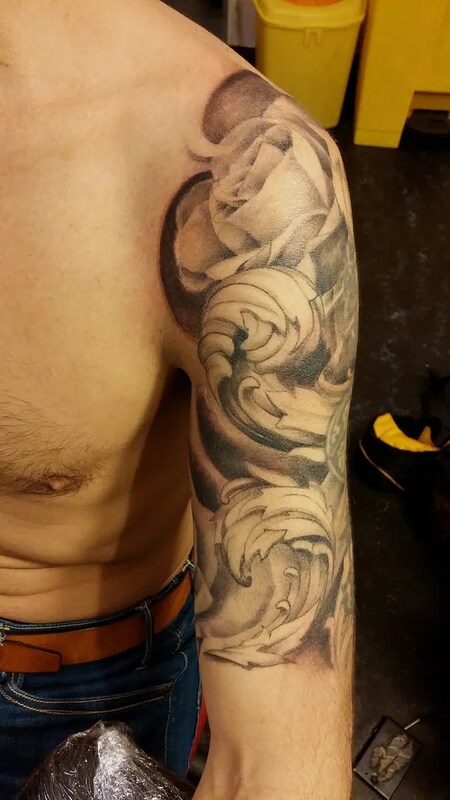 a bit of a random mixture of dates for this blog, but i went to Hamburg in the week between and felt it would be more sensible to group the work into blogs relating to the countries the tattoos were done in. 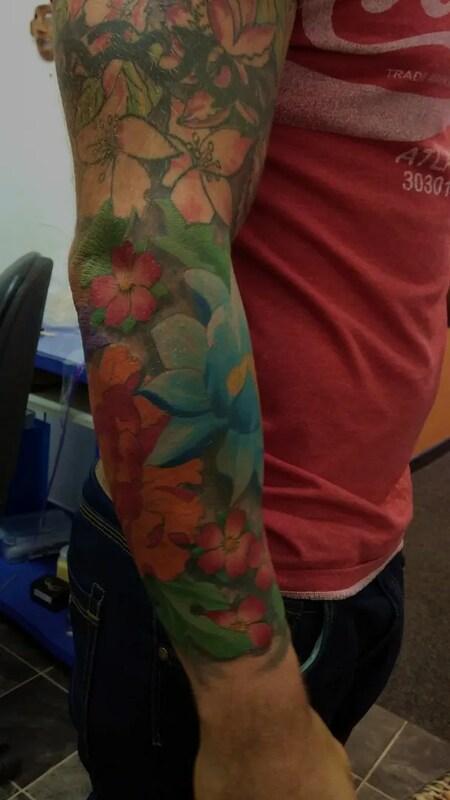 before I left for Hamburg I had Gerald’s mum in, we are slowly working on a sleeve, she doesn’t like black, so it’s all in very soft colours. 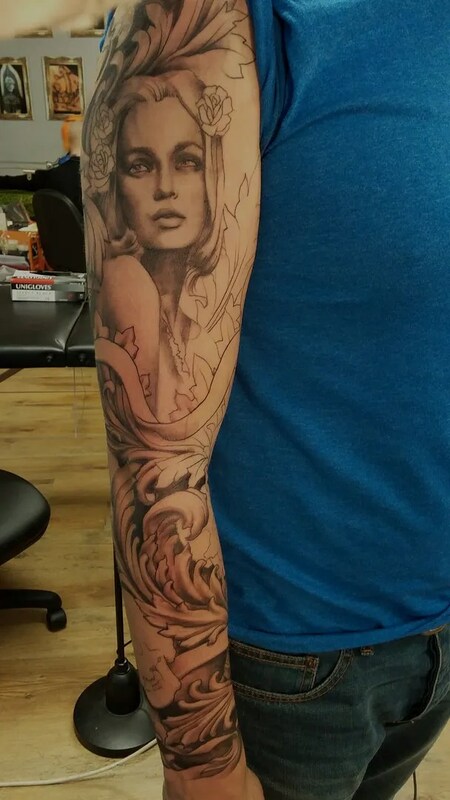 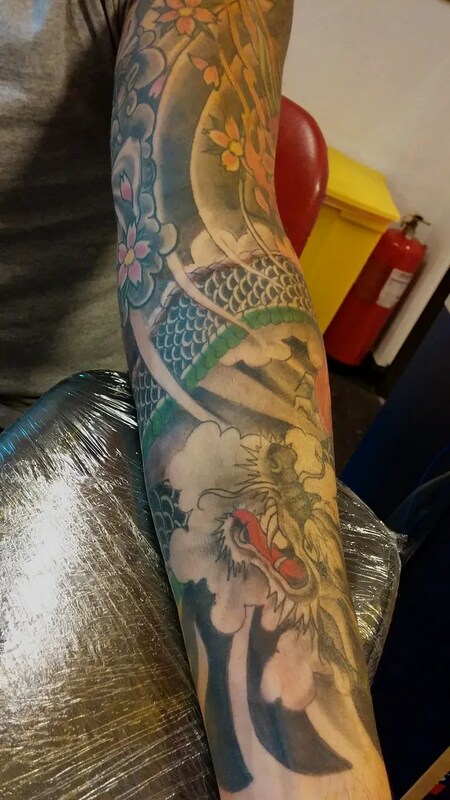 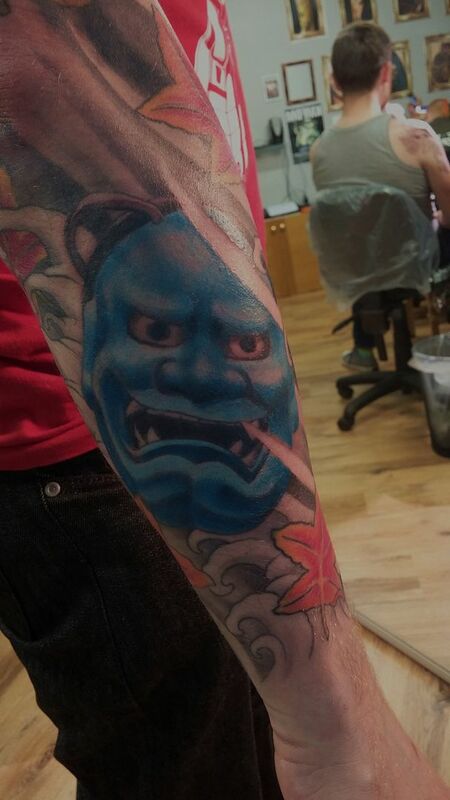 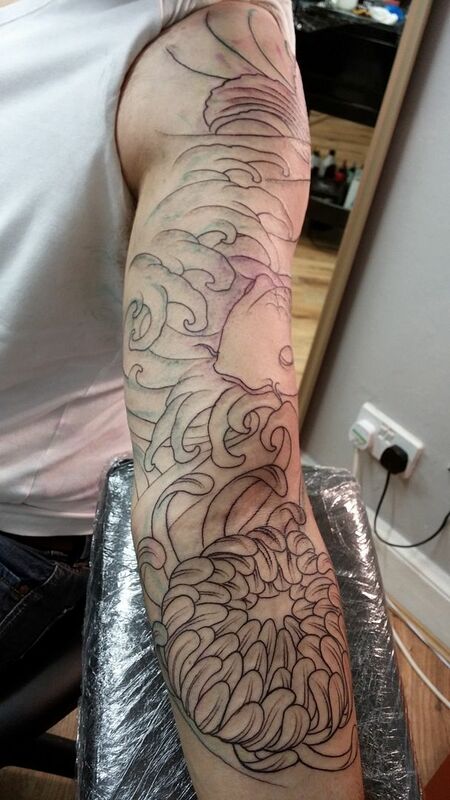 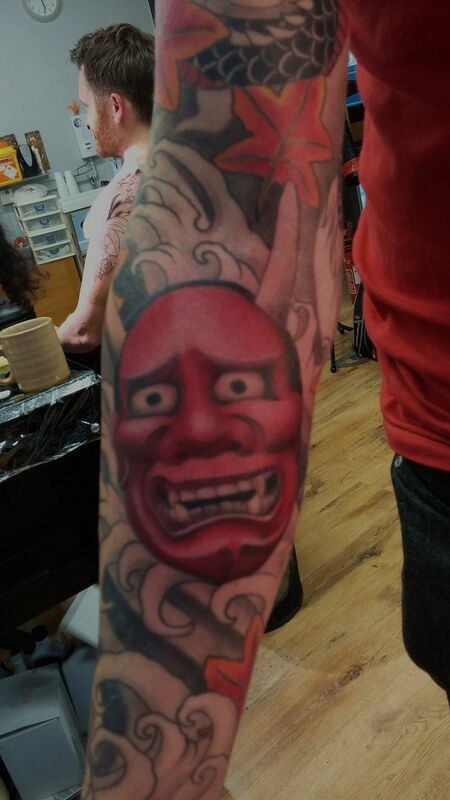 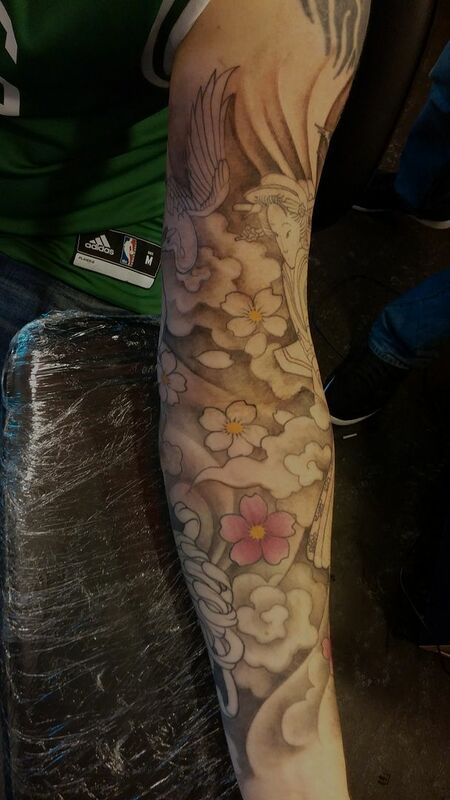 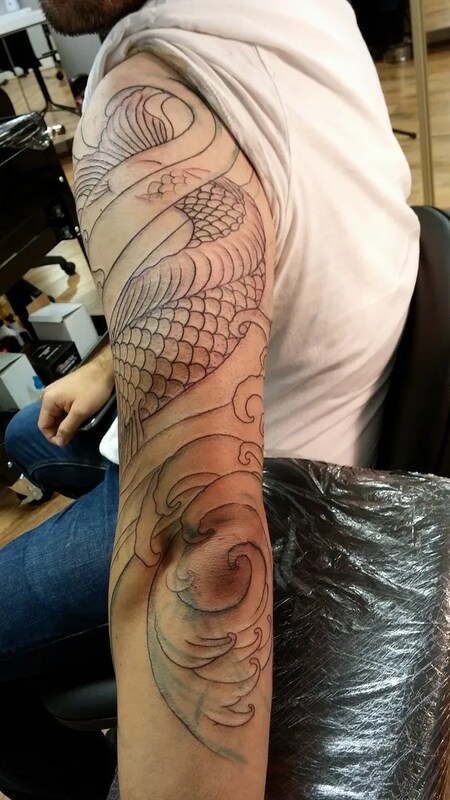 Ross had a short session on his geisha sleeve, unusually he is working on two sleeves at the same time, and today was the girly side. 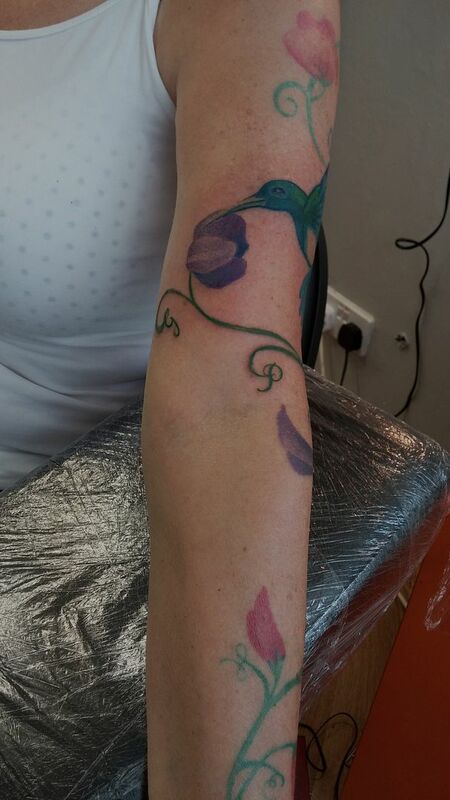 It always feels a bit strange, disloyal even, but it’s good to step out of your usual world sometimes! I always come back with new ideas and insights that make me think. 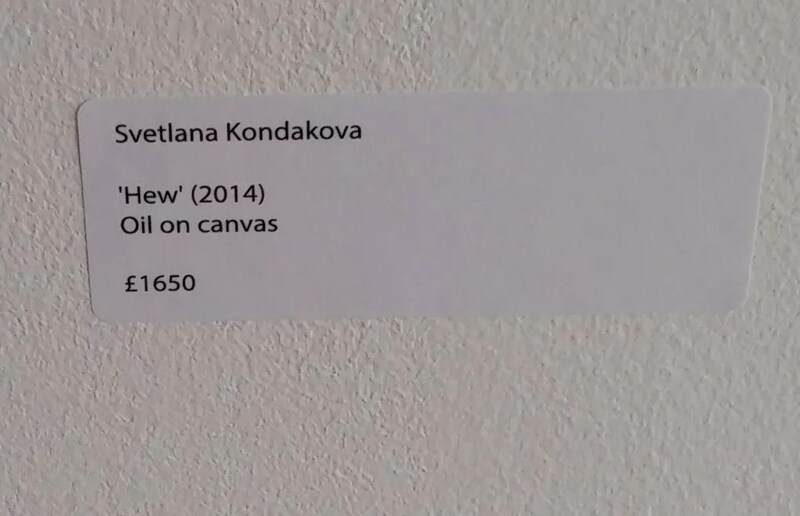 And that’s what it’s all about i suppose. 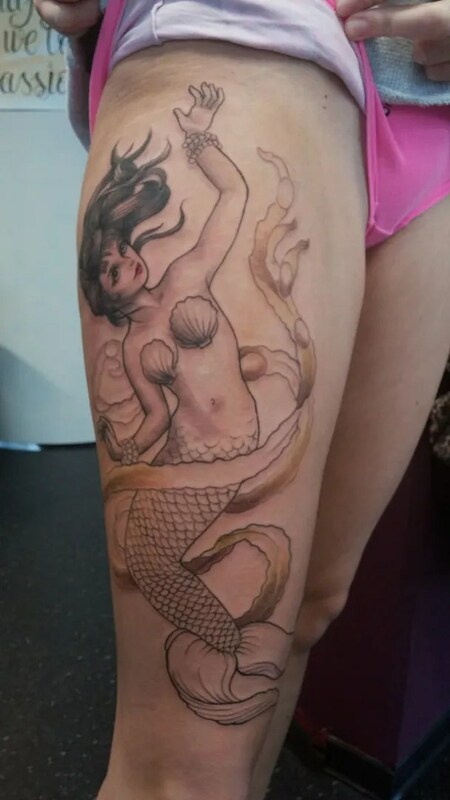 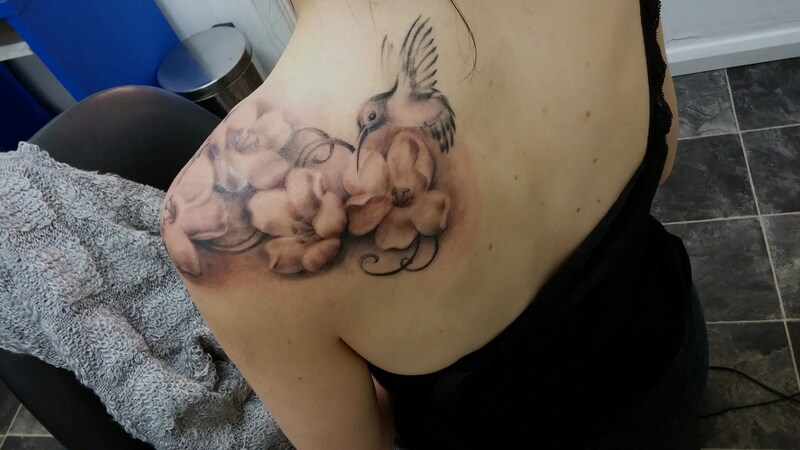 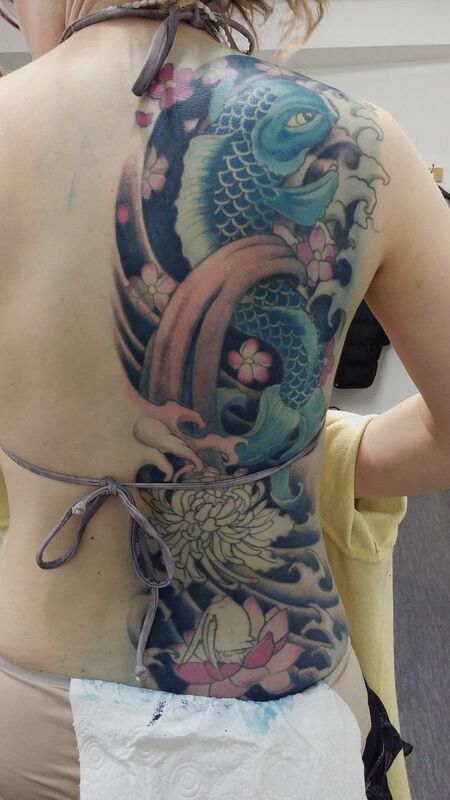 I have my regular clients in Hamburg, and projects I work on when I am there, like Sandra’s backpiece. 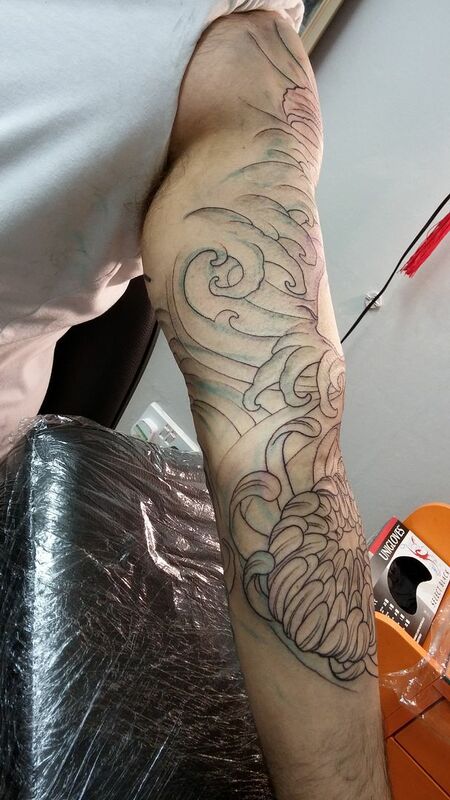 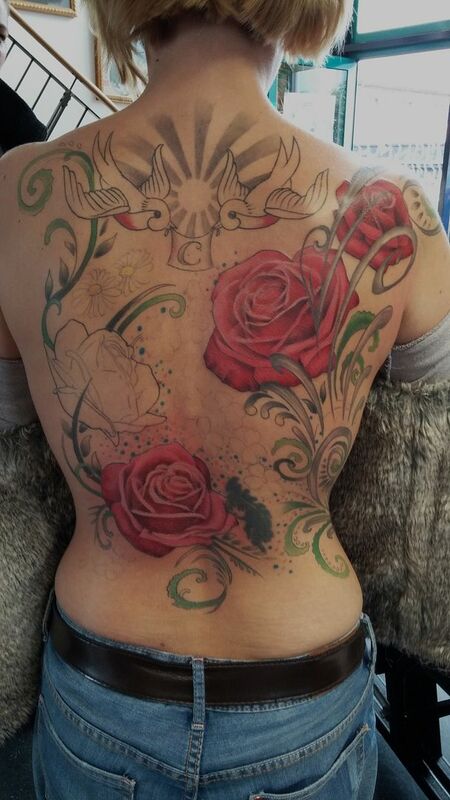 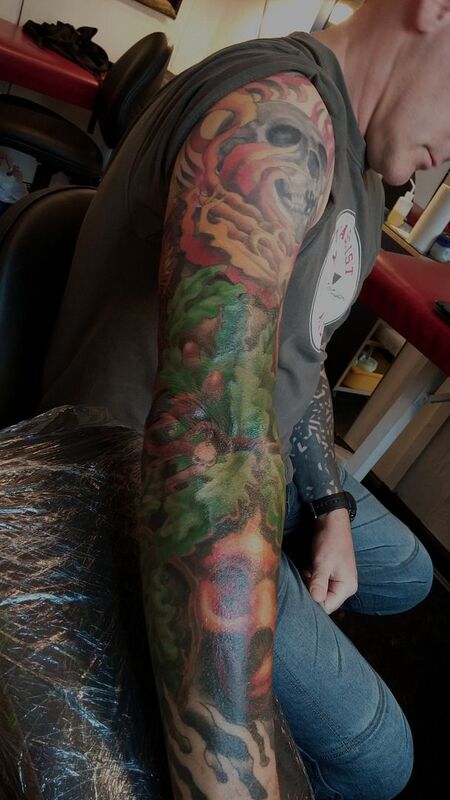 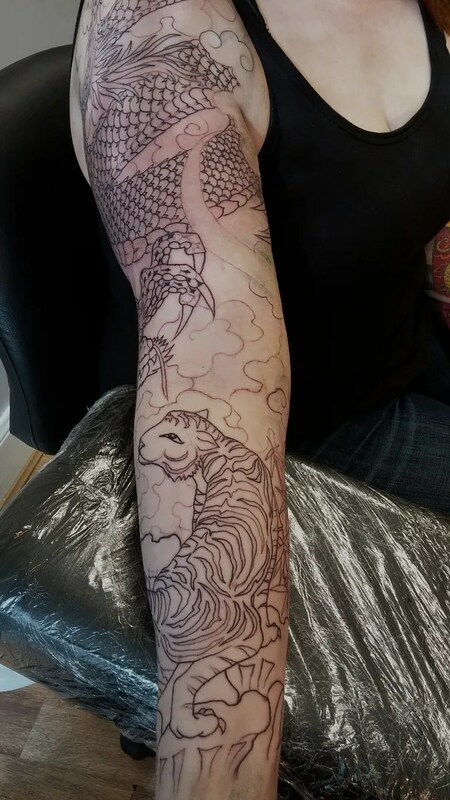 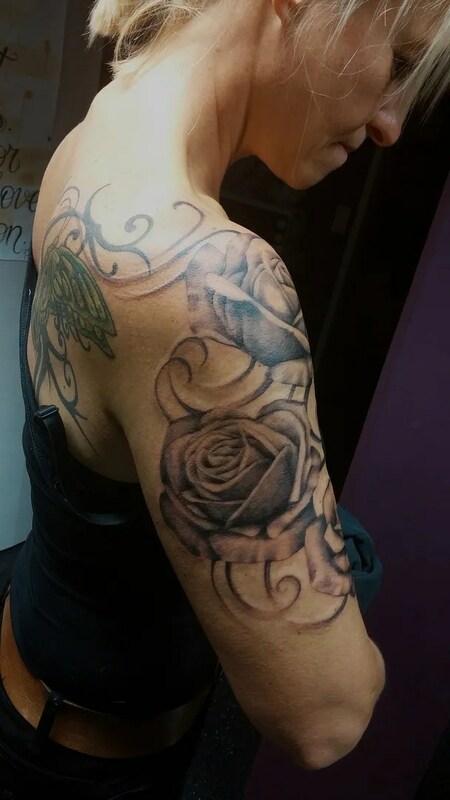 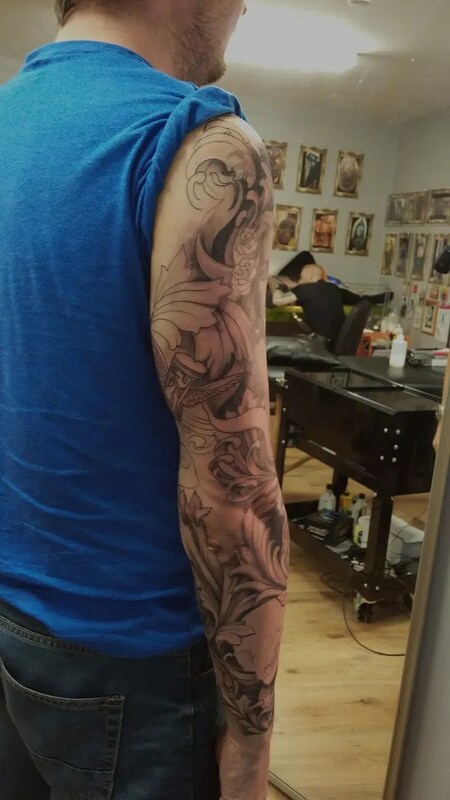 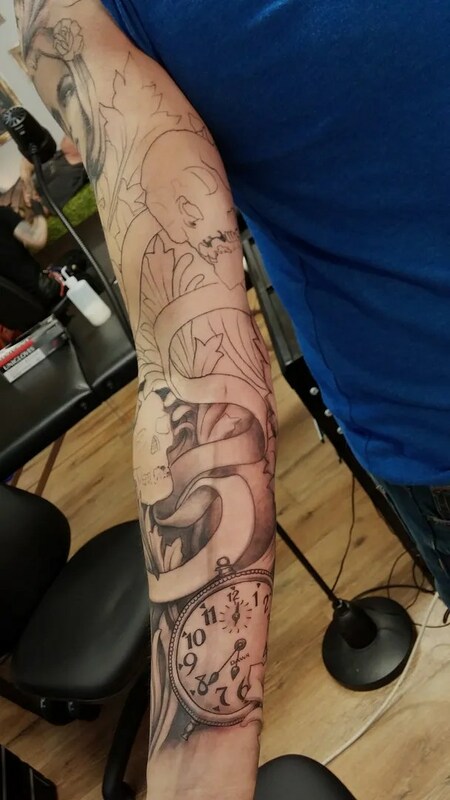 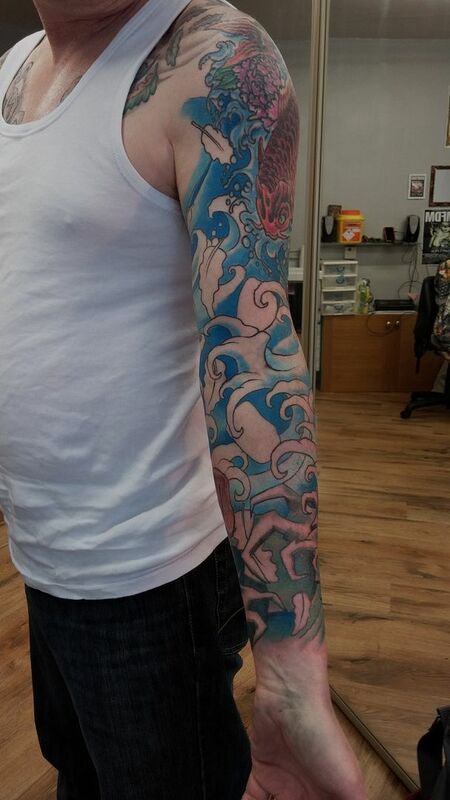 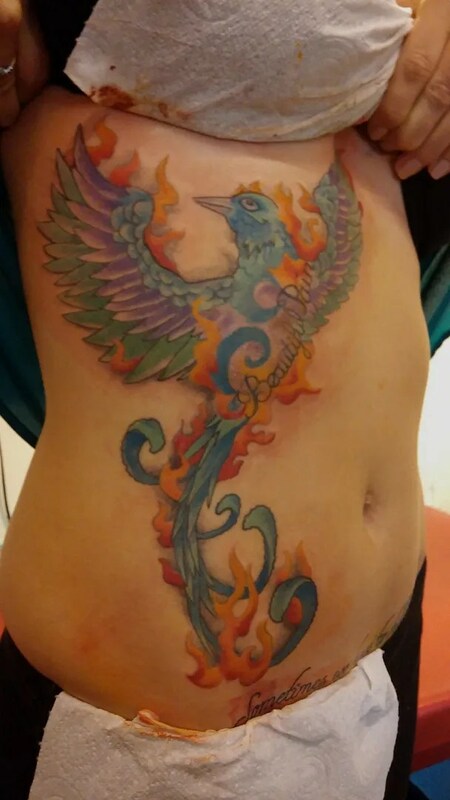 we started it last time, the brief was to add to some tribal style swirls and make it into a whole back piece, incorporating a variety of elements that Sandra liked. 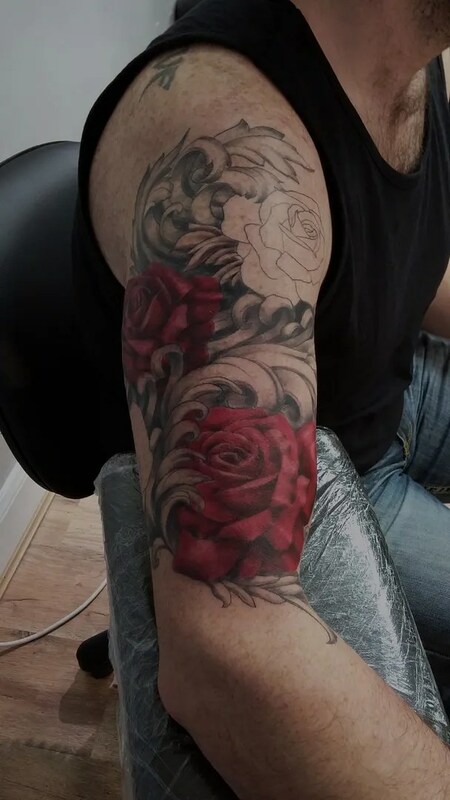 We had done all the outline and started on little bits of colour here and there, but today we got stuck into the roses, lots of reds and pinks. 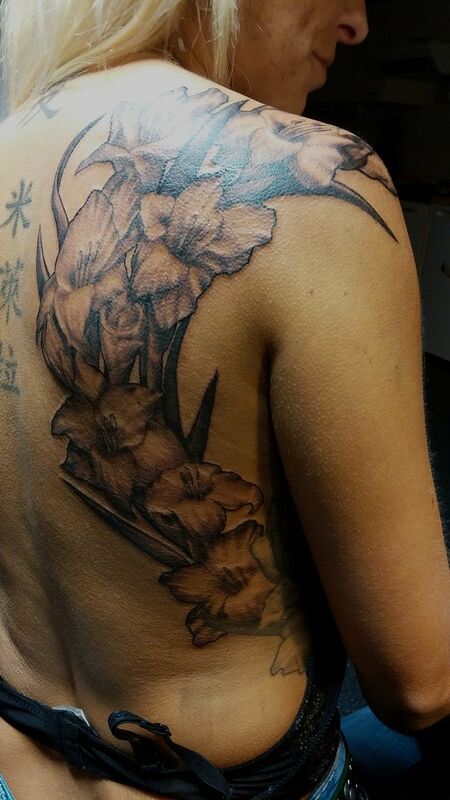 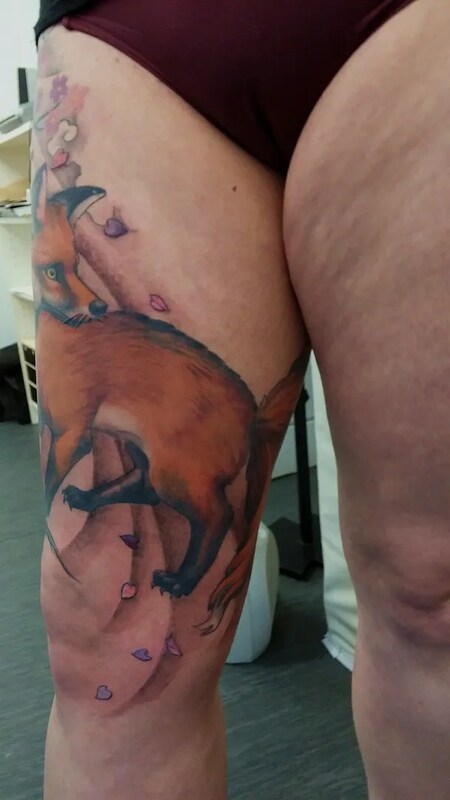 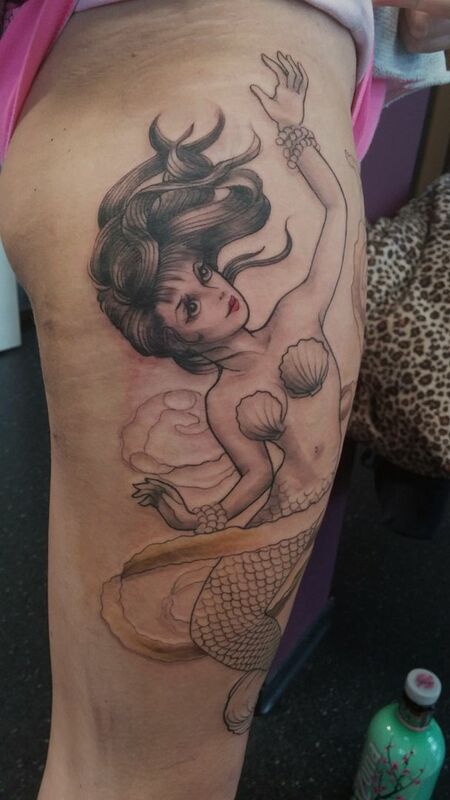 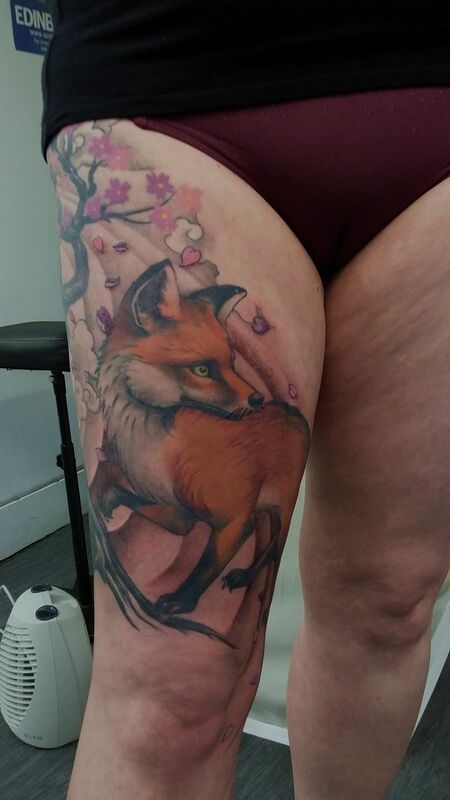 More flowers next, Mirella had got a gladiola on her hip and side done by me when I first came to Jungbluth, 3 years ago now. 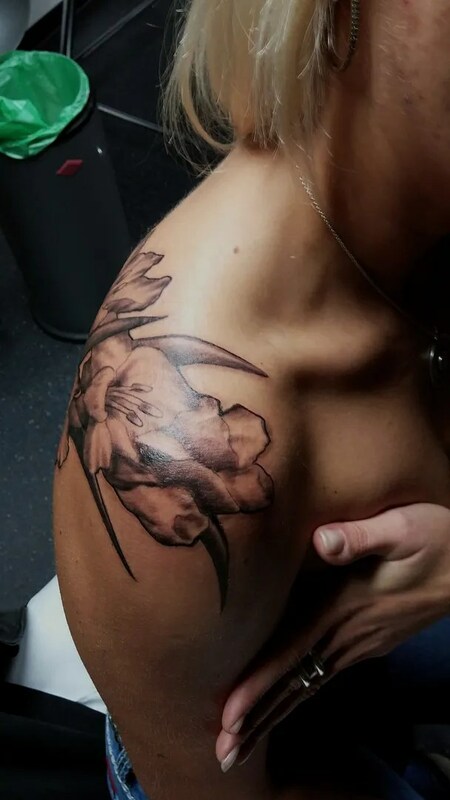 She had decided it was time to grow some more gladiolas and wanted to extend the piece up and over onto her shoulder, which worked well-specially considering gladiolas are such straight and upright flowers! 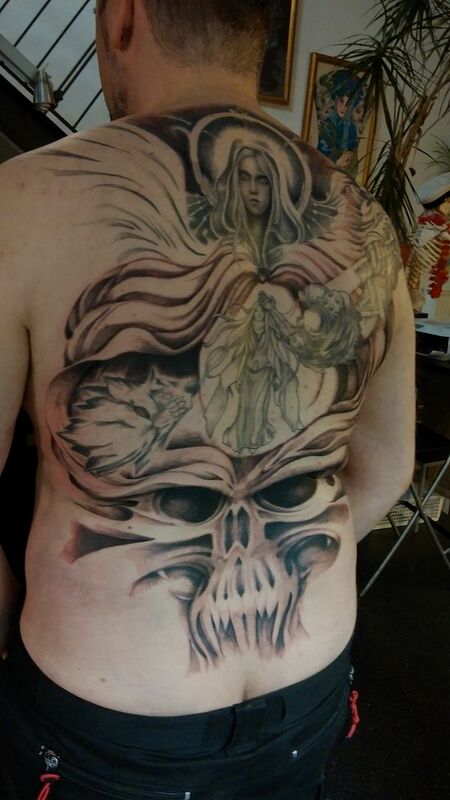 The next day another massive project, the second sitting on Marko’s backpiece. 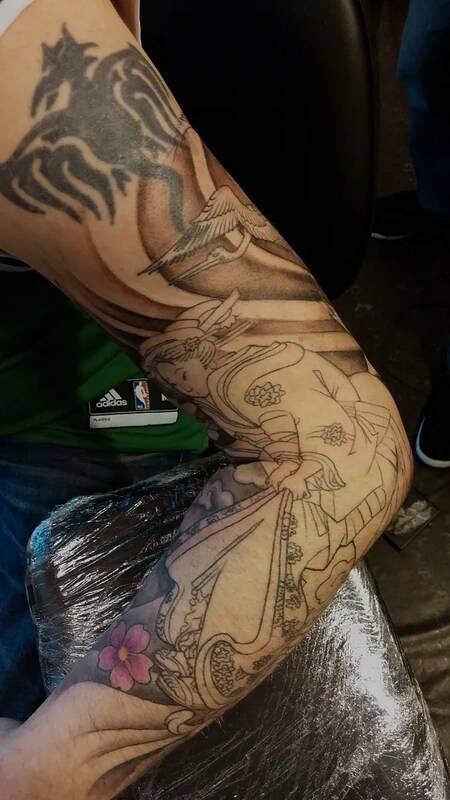 He sits for 7 1/2 hours at a time, an all day appointment. 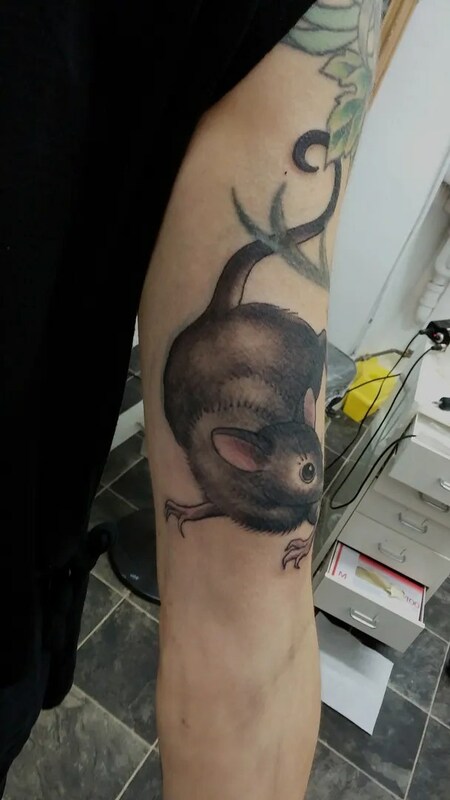 yes, dear people, he is nails. 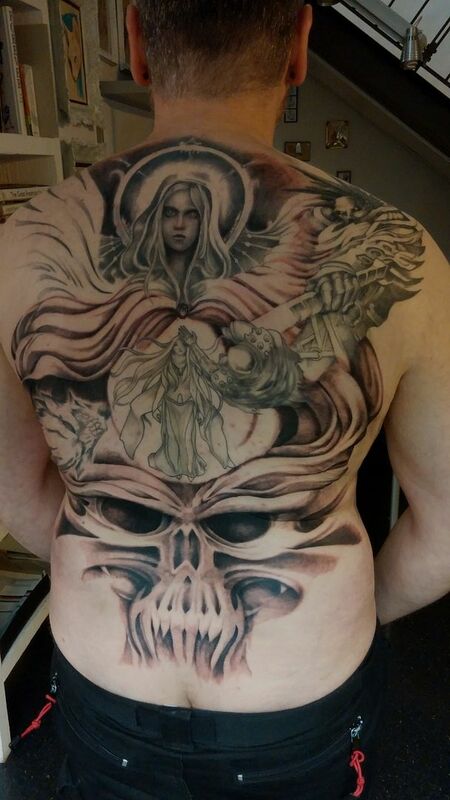 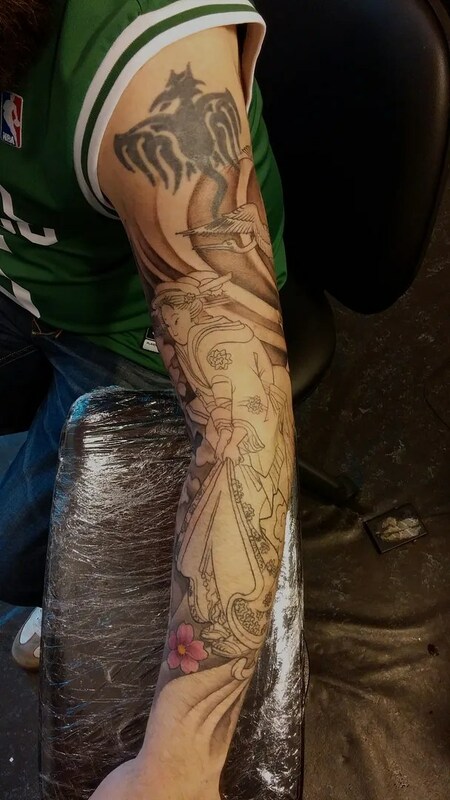 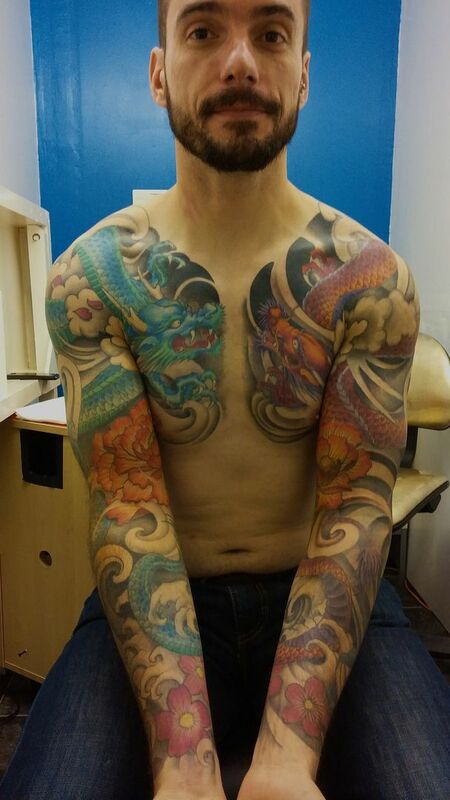 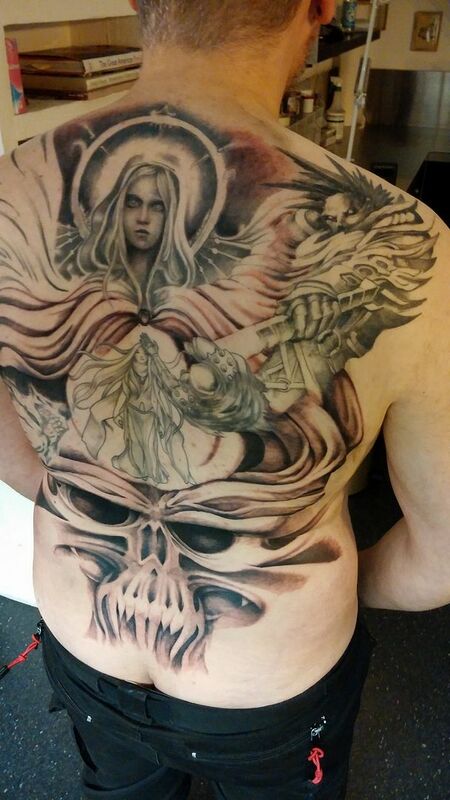 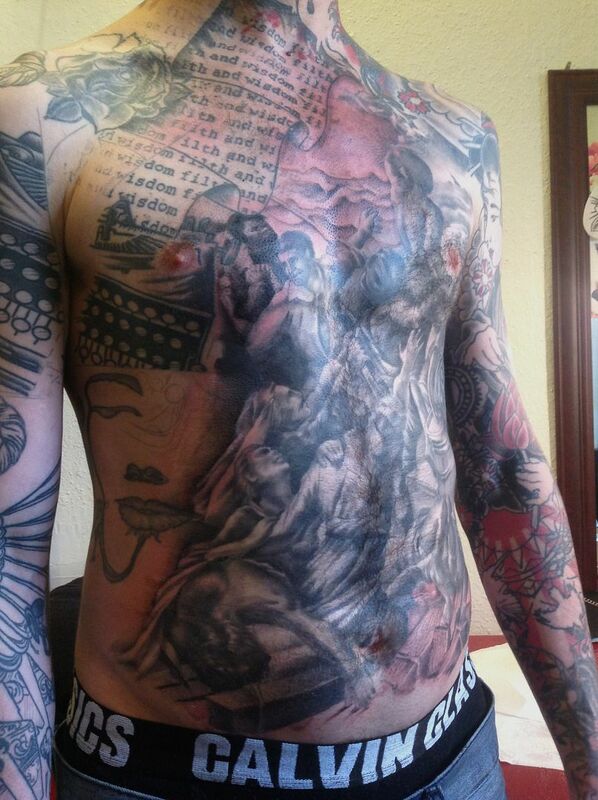 Marko loves comics and fantasy type of things, and his backpiece is a collection of images that tell a story. He lost me somewhat along the way with the narrative, but as long as I can put the images together for him in the way he wants them, that’s the main thing. Today we brought the separate images we did last time together, with the cloak of the upper figure which turns into a nasty skull at the bottom. 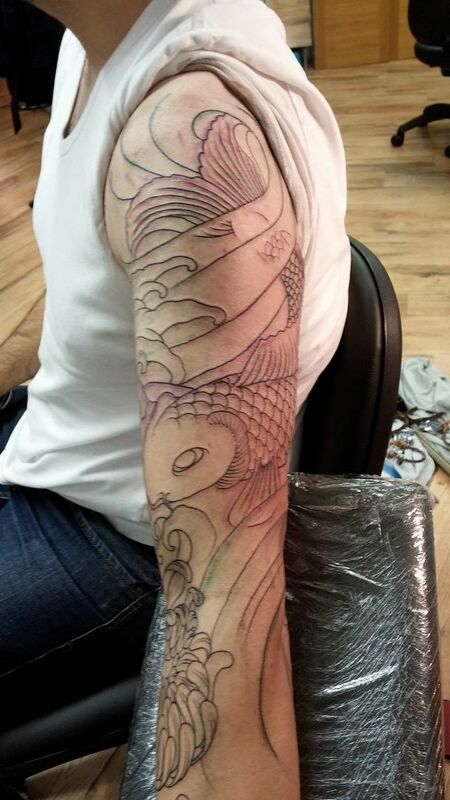 Next time there will be some colour and we will be working on the detailling, too. 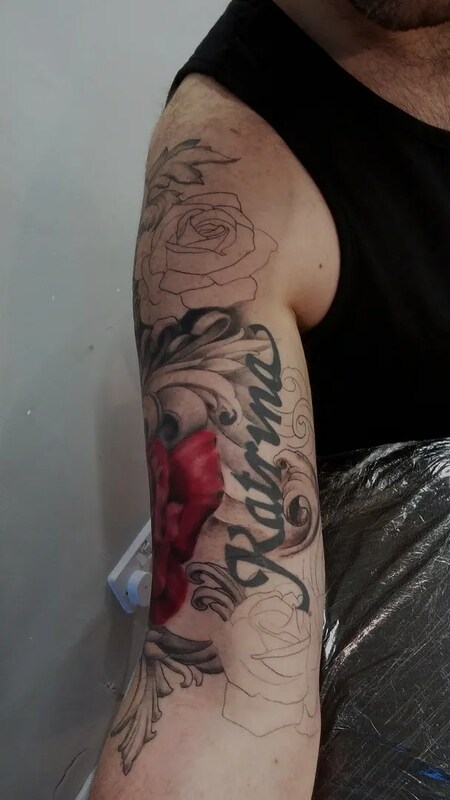 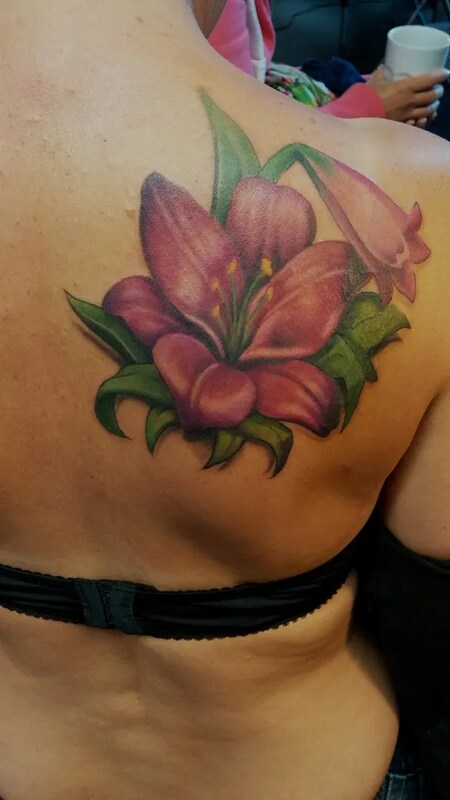 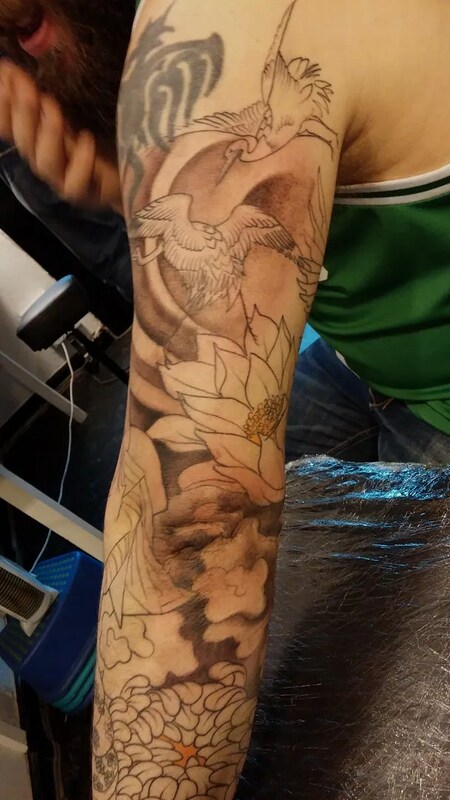 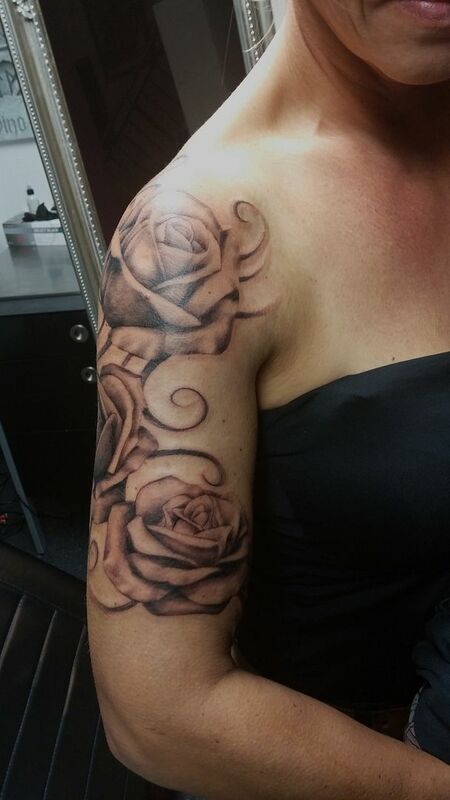 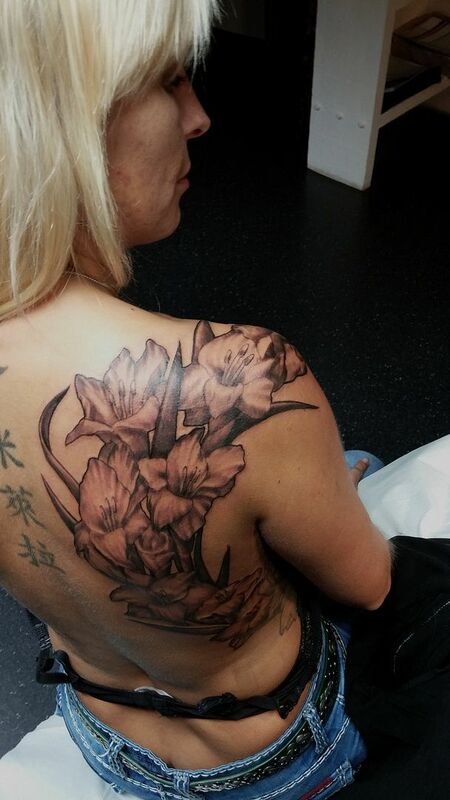 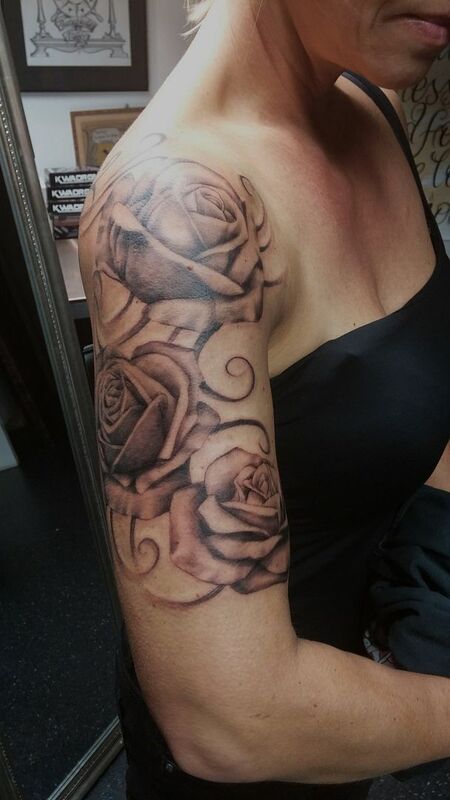 Nicole wanted a cover up of a wee red devil, it’s hidden in the darker leaves of the lily here. 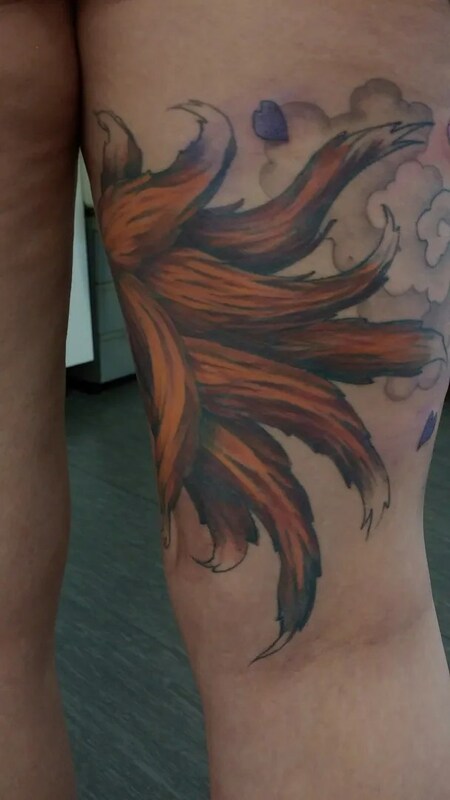 We might need to go over some of those leaves again next time I’m there, cover ups like that usually take a second coat in places. 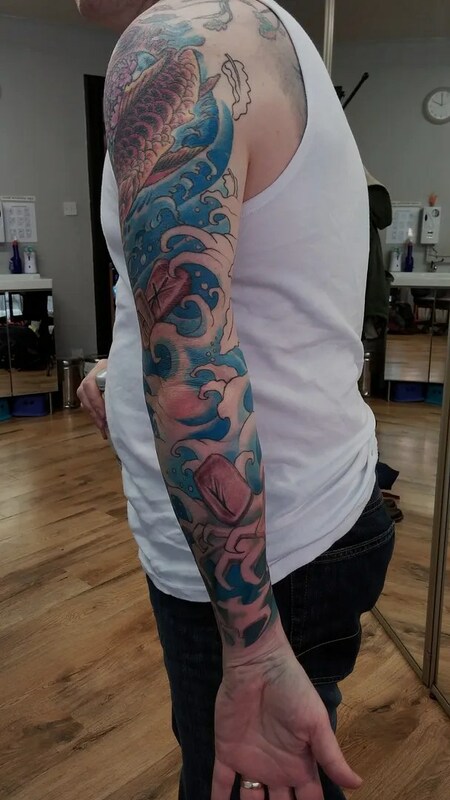 Aileen with the geisha sleeve has decided she wants another sleeve-this usually happens- and it’s a play on/ echo of the geisha side. 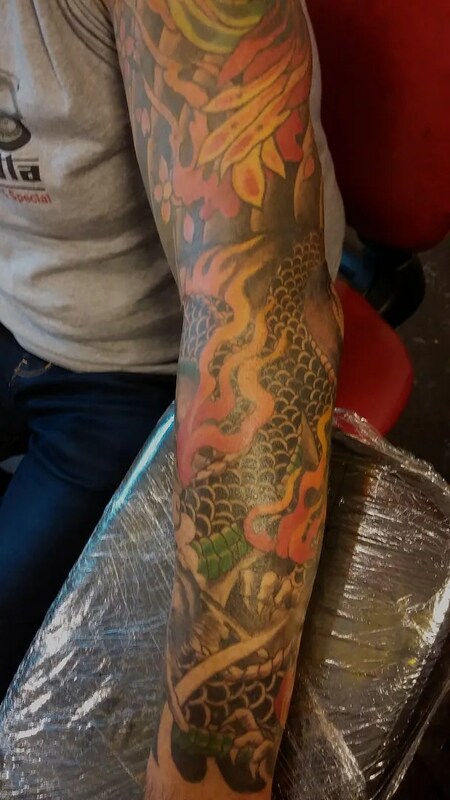 The tiny golden dragon on the geisha’s kimono makes a reappearance, but on the other side now it’s full size and fills the whole upper arm. 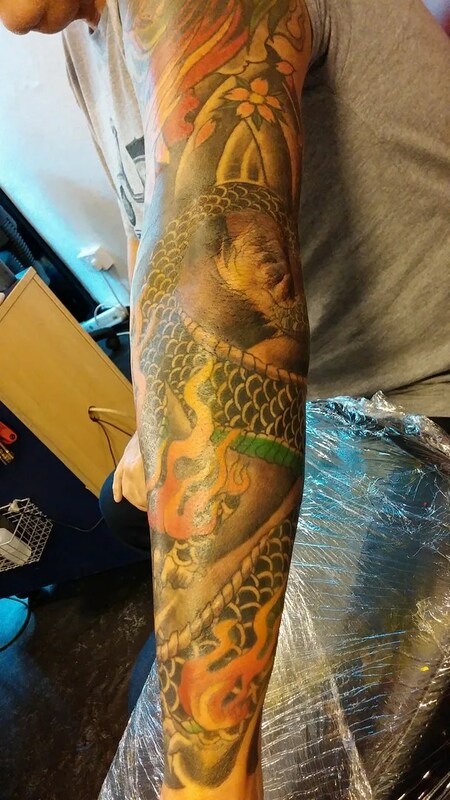 The level of detail and intricacy of the kimono fabrics on the other sleeve is echoed in the fancy scales of the dragon (which will be golden, of course). 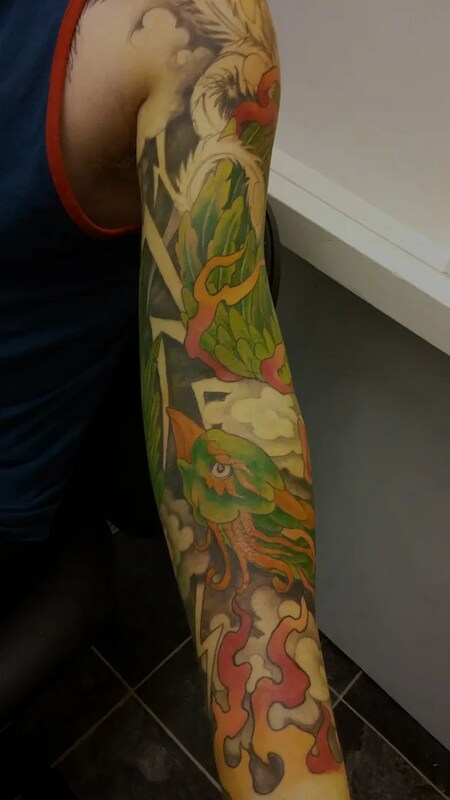 the general flow and sweep of both sleeves is similar, so they will look related at least, but of course not identical. this is a mucha inspired figure of a muse, with orchid flowers around her. 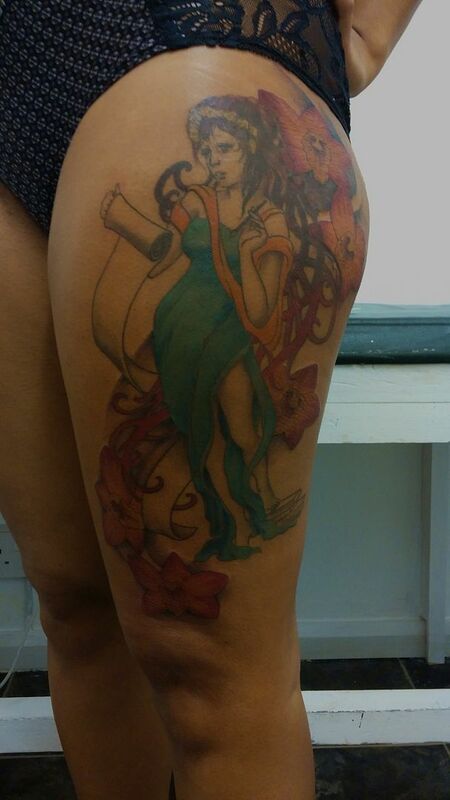 Mariah has dark skin, so the colours appear more muted, but in this case that’s a good thing. 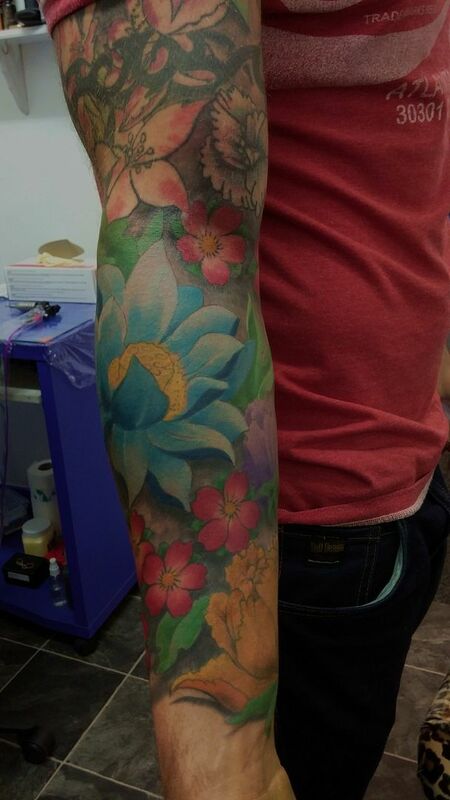 The colours harmonize well, unified by the skin tones. I went to an art exhibition today, and there i spotted a beautiful painting of my former customer Hew. 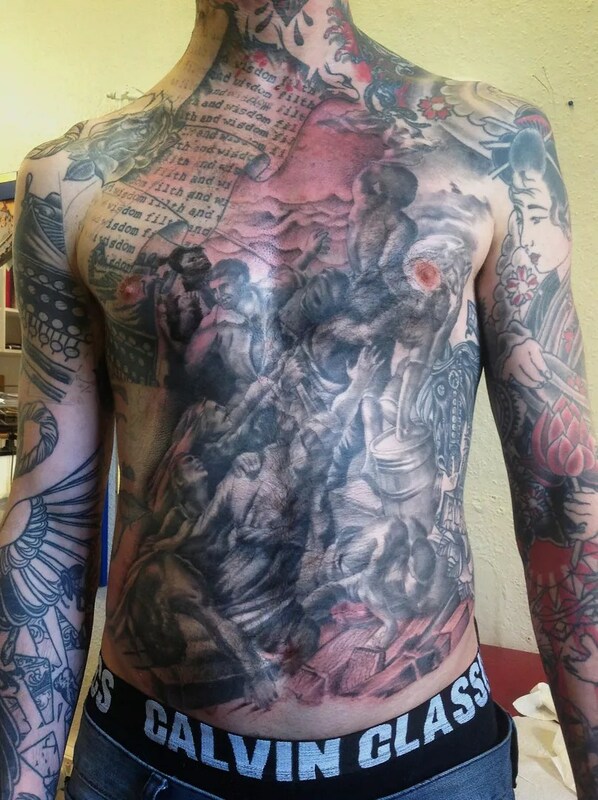 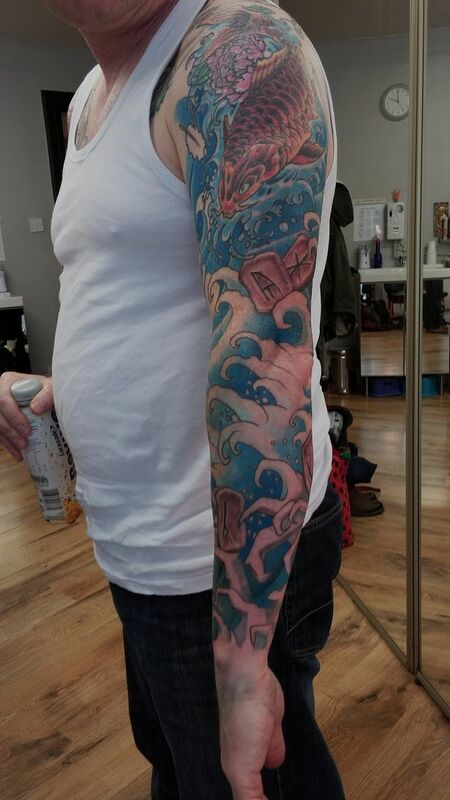 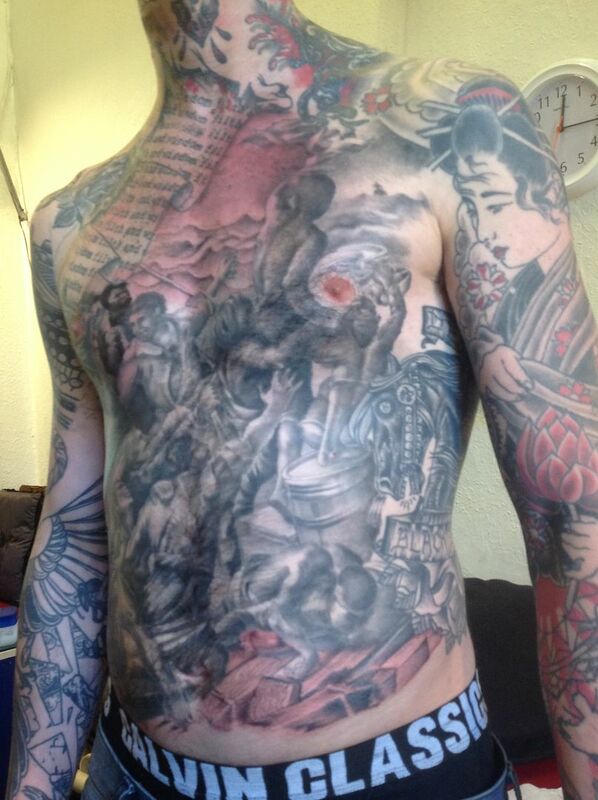 The artist has reproduced the tattoos I did for him, it was a bit surreal! 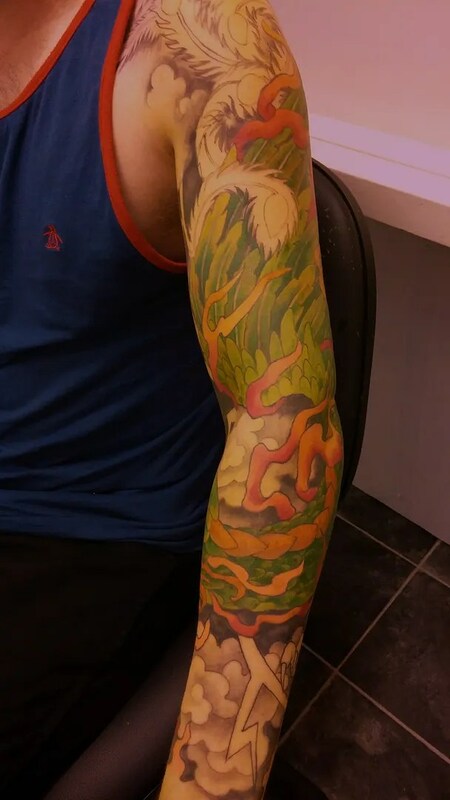 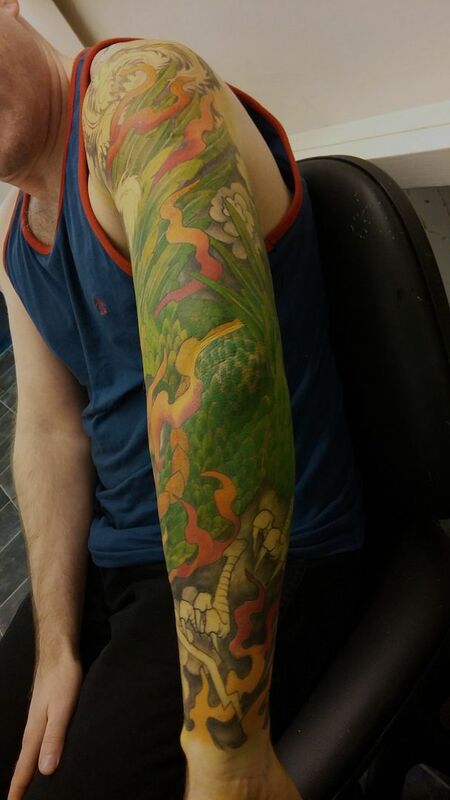 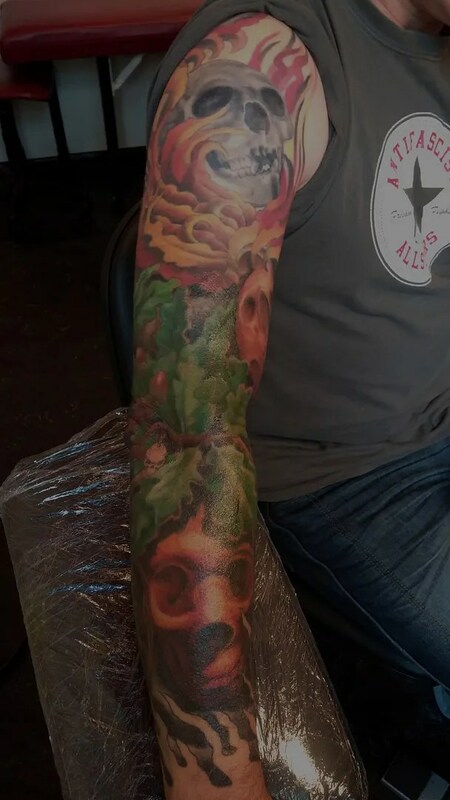 Hew had shown me designs he had come up with (he is an artist himself) and i adapted them to work as tattoos. 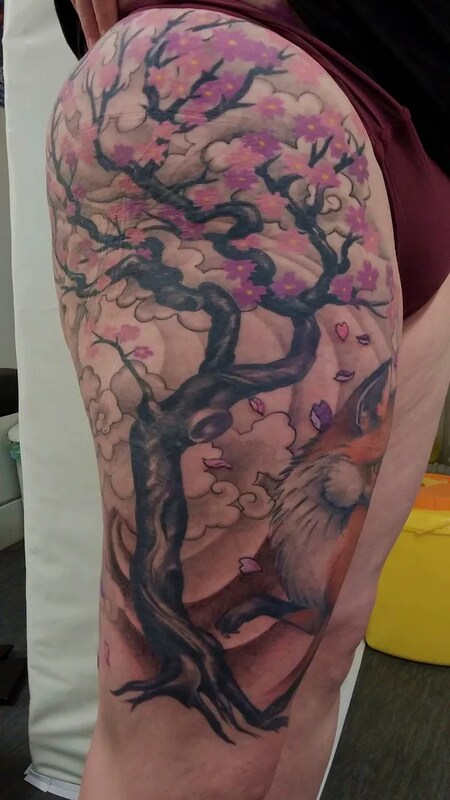 One side was a tree, and the other side contrasted in some way, I forget the exact meaning of them. 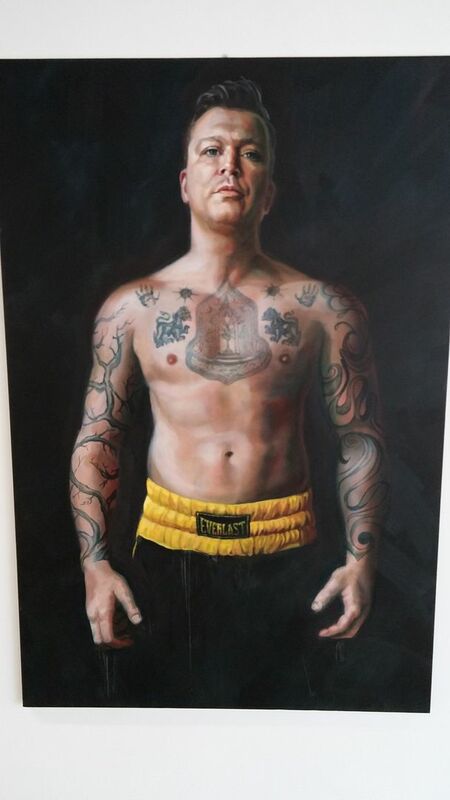 Judging by this painting, he has had some thai tattoos added to his chest now, and it looks like he has taken up fighting, maybe thai boxing, who knows. 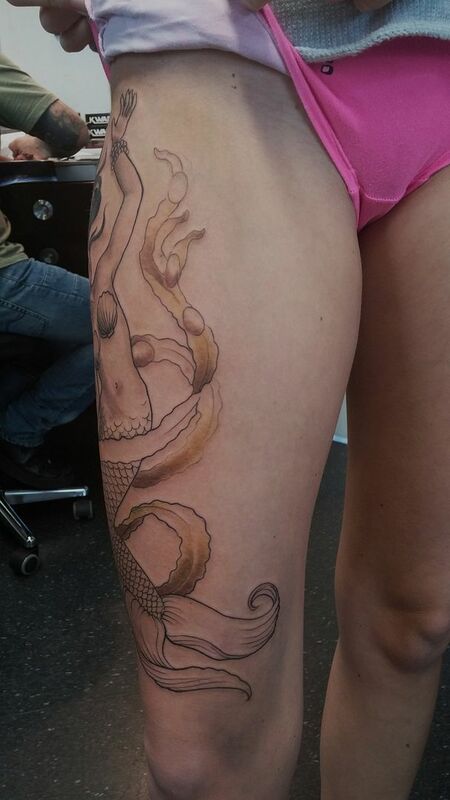 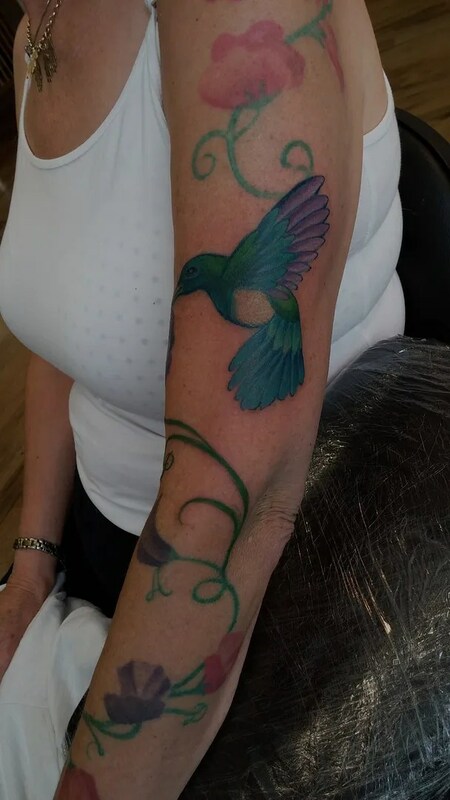 I will need to try and contact the painter and congratulate her on an amazing piece of work, and see how it felt to paint someone else’s tattoos. 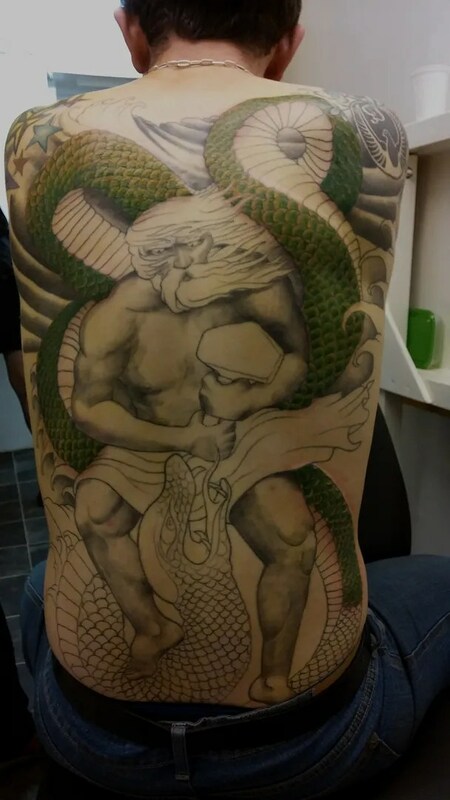 Normally there are just two people involved in the process of a tattoo, the wearer and the artist. 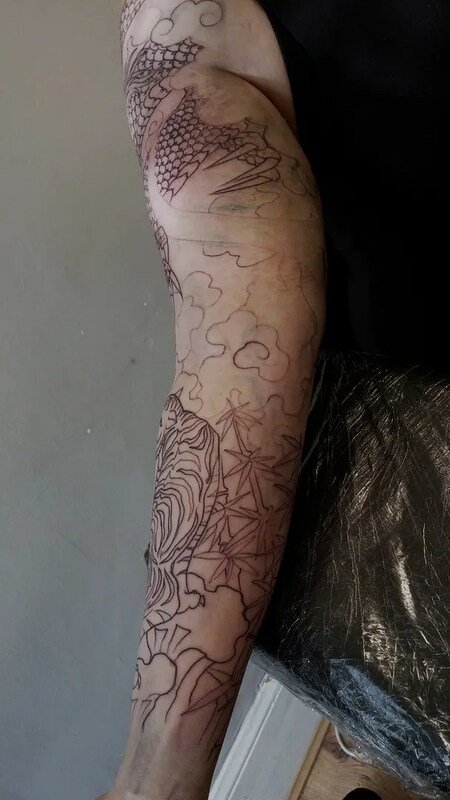 I feel like there are three of us here now, she has added another angle in a way, the tattoos have been through her eyes, her brain and her hand now- I feel we have a shared experience in a strange way, and I’d like to meet her.